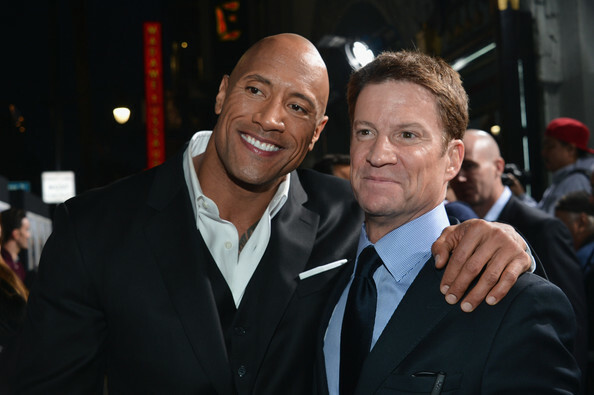 Dwayne “The Rock” Johnson (left) with Hasbro CEO Brian Goldner (right) at the GI Joe Retaliation premier. Photo thanks to Zimbio. A bit of humbling news on Hasbro’s Brian Goldner appeared yesterday. However, it may not be as bad as it seems. What kind of madness is this? Is Disney planning some sort of global entertainment takeover? MTV Geek comes through with this piece of news and says that Disney and Hasbro are in serious talks to buy this big company. OK folks, take this one with a grain of plastic for the time being. Unless you’ve been under a rock, you’ve heard that Disney acquired Lucasfilm for roughly $4 billion last week and Marvel for around the same price a few years prior. Well, we have it on good authority that serious discussions are happening at the highest levels of both Disney and Hasbro to fold the largest toy and game company on the planet into the Mouse. From what we’re told, these are still just discussions at this point, but serious enough that something could be announced at any time and create ripples throughout the entertainment industry. The Lucasfilm acquisition has been reported as taking as few as 6 months to complete. On the other hand, Disney Chairman and CEO Bob Iger has until 2015 on his current contract, and he waited about 3 years in between the acquisitions of Marvel and Lucasfilm, so we may be without firm news on this for some time. The acquisition would give Disney the rights to Transformers, G.I. Joe, Dungeons and Dragons, Beyblade, Battleship, Nerf, and Magic: The Gathering among several dozen other game titles and IP. When you add Marvel and Star Wars to that list it’s a pretty comprehensive lock on boy’s entertainment; a far cry from a few years back when Disney was heavily criticized for losing its grip on boys. Hasbro holds the toy and table top game licenses to the now Disney-owned Star Wars and Marvel, and has shown great success with those franchises, as well as exploiting their own IP across film, television, and games. We’ve already seen some cross-pollination with Star Wars Transformers and Monopoly. And Hasbro isn’t shy from M&A having scooped up Parker Brothers, Kenner, Tonka, Milton Bradley, and Wizards of the Coast over the years. So from an outsider’s perspective this makes a ton of sense for all involved. So if this turns out to be true, what will it mean for these franchises and their homes, and what will it mean for The Hub, the Hasbro-Discovery JV cable net? The Transformers and G.I. Joe films are with Paramount, but as we saw with Marvel, that could easily change. The animated series are with The Hub, along with Beyblade, Kaijudo, and others, and it’s not clear how that channel would fit into Disney’s plans. They could be folded into Disney XD, and the girls brands folded into Disney Channel. On the comics’ side this would be bad news for IDW, just as the Marvel acquisition was for BOOM! and the Lucasfilm acquisition is likely to be for Dark Horse. If they end up buying Hasbro, who knows that Disney will do with it? Mickey Mouse/Disney themed blasters? 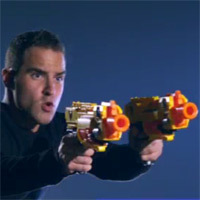 As long as Nerf keeps giving us good quality, innovative toys like their used to, I’ll be happy with that. No N-Strike Elite blasters spotted in the flesh yet, but The Toy Spy got a good amount of photos of Hasbro’s display. Thanks to SMU Toys, we get a look at some stuff on display at Nerf’s Comic Con 2011 booth. From wired.com which I got off Nerf’s Facebook wall and Twitter. The link basically says that it’s selling $24.99 at booth #3329 when Comic Con starts. Also after Comic Con you can buy them at hasbrotoyshop.com. The paintjob isn’t bad, and that price for a collectible seems decent. Strange how it’s not on their youtube channel yet. They claim in this video it’s the fastest firing blaster yet. I might have to put that to the test in a video. Congrats Nerf! Also you can hit the jump and check out a video clip reward them People’s Play of the Week back in October.